Growing your own food is one of the most rewarding things you can do. Whether you live on rural acreage or a city lot, virtually anyone can grow a simple garden - regardless of your skill level and busy schedule. How to Grow Anything: Food Gardening for Everyone is a practical guide for cultivating fresh produce from seed to harvest. 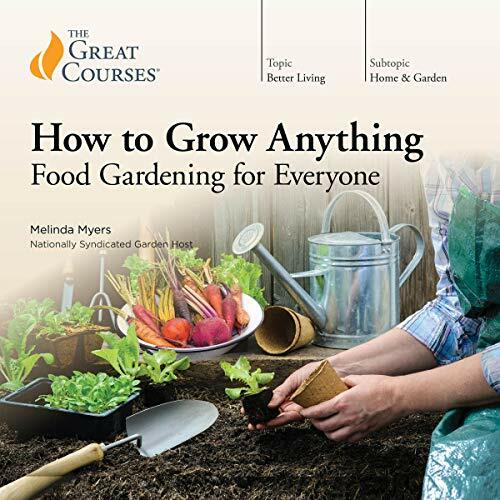 Taught by renowned horticulturist Melinda Myers, these 12 hands-on lessons are chock full of tips and tricks for novice gardeners and green thumbs alike. Whether you simply want to grow herbs in a window box for your homemade spaghetti sauce or you dream of cultivating a dazzling orchard, How to Grow Anything: Food Gardening for Everyone offers everything you need to grow fresh food right outside - or inside - your home. this was far subpar to the standard I'm use to from TGC content. I was expecting an academic approach to gardening, I was hoping to learn more on soil theory & compost methodologies and instead I got a YouTube audio strip. With content focused on the presenters personal taste with little substance or course structure. This was the first Great Coarse "Lecture" I have returned.